Wij fokken Groenendaelers uit werklijnen. Wij fokken af en toe een nestje, waarbij ons streven is om gezonde maar vooral stabiele Groenendaelers te fokken met veel werklust. Daarnaast voeren wij onze honden via de wetten van de natuur (natuurlijk rauw voeren) omdat wij dit de gezondste manier van voeren vinden. Heb je vragen over onze honden, neem gerust contact op. The mother of the litter is Aviendha of Karo's Triangle. She is born in our second litter on 27th April 2012. Her parents are Sergeant Denzel (IPO3) and Deanna Space Nena di Zinxavi (IPO1A, Working Permit Mantrailen). Aviendha is being trained by Femke, mostly in IPO. Besides IPO, they also train some agility and tricks for fun. Aviendha is a girl with a lot of drive and speed in training. The game with the decoy is the best thing there is for her. She loves it. She has a certrain amount of independence and has a lot of power. She can be a bit zestful at times, but doens't go crazy if there is a day without training. This will be her second litter and she really has proven herself as a mother in her first litter. Very caring with her puppies. She allowed them to drink milk with her until they were ten weeks old. Aviendha is HD-A (with Norbergw 40), ED 0/0. When she was 18 months old she passed the NVBH behaviour test with highest possible scores. She passed her Herding Instinct Test. She has her VZH/BH and is now on her way to IPO 1. The father of this litter will be Eloisa Raven. He is born on 18th June 2011 in Finland. 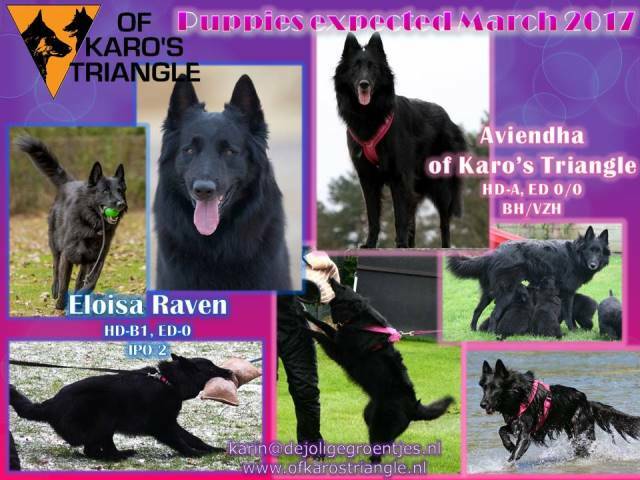 His parents are Einar von Watzdorf (Tervueren, Rescue Dog) and Picxie de Lescaut (Finnish Working Champion tracking). I saw Raven for the first time at the Randmeren Bokaal in 2013 and I loved him right away. He was a young male back then, but I loved his attitude and appearance. He also reminds me of my Orlando.We met him in December again and now he is matured, he leaves an even bigger impression. He is an open and stable male. Very friendly and with lots of energy. He has a lot of prey drive and a great willingness to work. Raven has IPO2 and is now on his way to IPO3. He is HD-B1 and ED 0. We are really excited about this combination. Both dogs have a lot of drive and both love to work. Ravens commitment to work compensates Aviendha's independence. And his stable and balanced character is a nice addition to her feisty behaviour. This will be pups that can do great in different types of sports, such as agility, IPO, obedience. They will need an active life. Although Raven has Tervueren and Malinois in his lines, we don't expect any other color then black in the litter. Aviendha has Tervueren in her lines, but it is a couple of generations back.